After announced its Amazon Great Indian Sale for this year, The Flipkart has announced The Flipkart Republic Day Sale 2019 is scheduled from 20th to 22nd January the same day as Amazon sale. 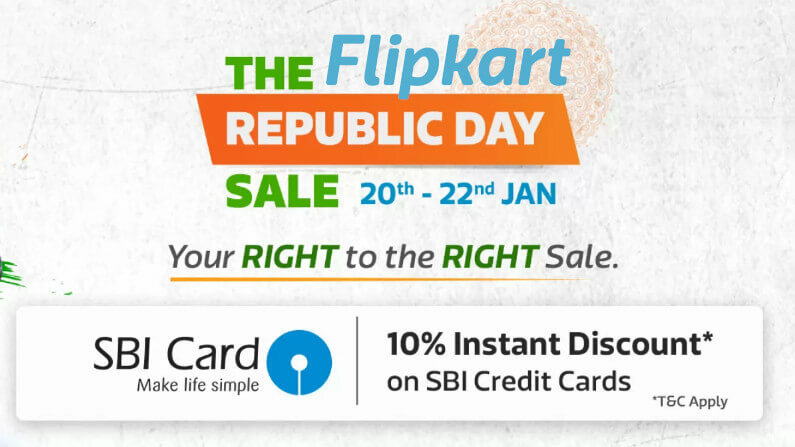 The Flipkart has partnered with SBI to offer 10% instant discount on the SBI Credit Cards. Other offers include the Debit Card EMI, No cost EMI on Credit cards, Exchange offer on Mobiles, TVs, Appliances, Laptops and more. During the Flipkart Republic Day Sale 2019 it will offer Block Buster deals on Mobiles, Laptops, TVs and more every 8 hours, Rush Hours extra discounts till 2 AM on January 20th, Extra 26% off every day from 2 PM to 6 PM, 10% off on Rs. 1450 worth shopping and 15% off on shopping worth Rs. 1950, Buy 3 get 10% off and buy 4 get 15% off, up to 75% off on TVs and Appliances, up to 80% off on electronics and accessories, up to 70% off on Flipkart brands and more.